The move to Canada from South Africa for me was the easiest out of my immediate family. I was fifteen years old at the time, and it was relatively easy for me to set down new roots. Looking back now, there were difficult things in moving here, but I can say it was all for the best. There were a couple of culture shocks I experienced when I arrived. Some were very small and easy to adjust to or understand; others were harder to understand. The small culture shocks hinged on words I had to get used to or the way people said things. However, one of the bigger culture shocks I had to get used to was the relaxed approach to security. South Africa is not exactly the safest place to live, but Canada is very safe in comparison, especially Calgary. There are no walls surrounding the houses -- especially no electric fences on those walls -- or even extensive alarm systems. No trellises anywhere either. Of course, this does not mean there is no crime in Canada. There are still dangers and we need to be aware of them, but they are to a lesser degree, which was a great experience. I could just get on my bike and go to the store. I could walk to the store, or just go for a walk. All of it was quite freeing. Unfortunately, the same cannot be said for computer security. There are many dangers on the internet, and one such danger is ransomware. Acronis claims attacks of ransomware has been going up in recent years, meaning more and more people are being affected by these malicious attacks. One of Acronis True Image 2018's biggest features is its updated protection against ransomware compared to last year's version, along with a few other things on the list. Read on to find out what they are! 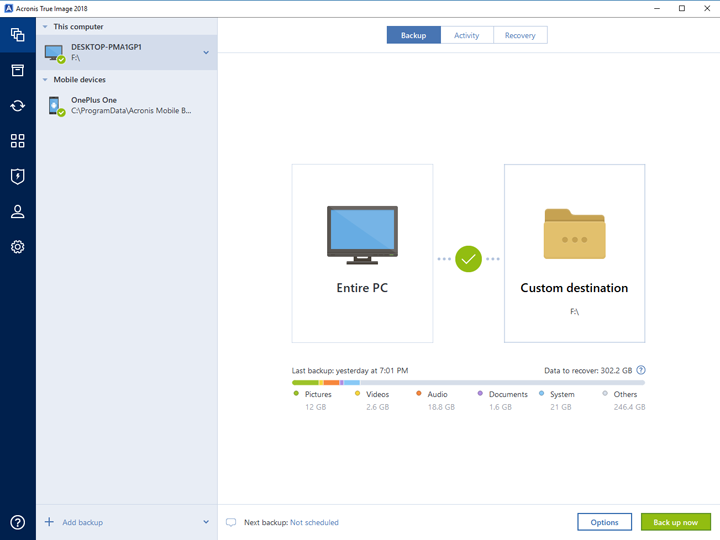 First off, the Acronis True Image 2018 has made some improvements to the backup process. After backing up your drive, there is a handy color coded bar at the bottom, as seen in the above screenshot. This color-coded bar informs the user of the amount of space the different categories use. The different categories are pictures, videos, documents, audio, system, and other. This is quite useful to see what is using up the most disk space on your computer. The next update is at the top, where there is an activity tab. After clicking this tab, it will list all the backups you have completed, as well as the time they were completed. If there were any issues during the backup, they will also be seen in this window. All of this is useful information. Acronis was also able to increase the speed by which the backups occur by up to three times from the previous version. This will make it a little easier to do backups. The usual features still apply from the 2017 version, such as scheduling. Acronis introduced Acronis Active Protection 2.0 in the 2018 version, and this active approach to protect data against ransomware is now in all the tiers of their product, not just the Premium version. There is also a new tab dedicated to Active Protection, which you can see in the above screenshot. Active Protection monitors all the processes on your computer, stating which ones are suspicious and which ones are not. Active Protection looks at patterns of how data is used on your computer, and anything outside of an already established pattern will arouse suspicion. As you can see, it will not terminate suspicious processes, but instead inform you that they are happening. There is also a whitelist and a blacklist to prevent too many false positives. Furthermore, the Acronis software itself is protected from any attacks as well. The way Acronis Active Protection 2.0 works in picking up changes in patterns can be quite useful to ensure your data and backups are protected from ransomware. As for the tools, there are a couple of new features. Active Cloning is one of them. It means you can clone a disk while the operating system is running. This can also be cloned onto USB attached drives. This makes it quite useful as it will not impede on the rest of your daily tasks. This entire process means changing drives becomes an easy instead of an arduous effort. The next feature is the one-click WinPE boot media, making the creation of bootable media a breeze. Otherwise, you can convert backups into virtual drives. Lastly, there is also automatic mobile backup to a NAS over Wi-Fi. All of the features above is helpful to make the upkeep of a computer easy and safe. The new features are a great addition to the already well rounded toolbox in Acronis True Image 2018. In Acronis True Image 2017, there is Facebook Backup. This was the only social media platform that a user could back up. However, in the 2018 version, Acronis has added Instagram. 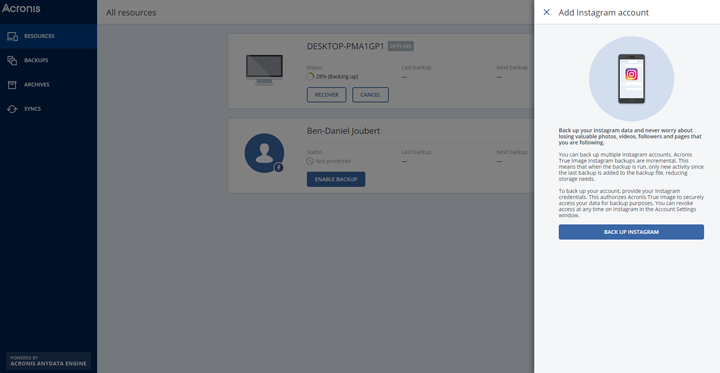 Acronis True Image 2018 has Instagram backup that can be accessed and managed through the online dashboard. Unfortunately, the same complaints I had about the online dashboard from the 2017 version is still present in the 2018 version. The dashboard is slow, and is still not the easiest or most intuitive to use. Confusingly, every time I clicked on an option, it opens a new tab. This meant after navigating the dashboard to the Instagram backup settings, I had about four tabs open. 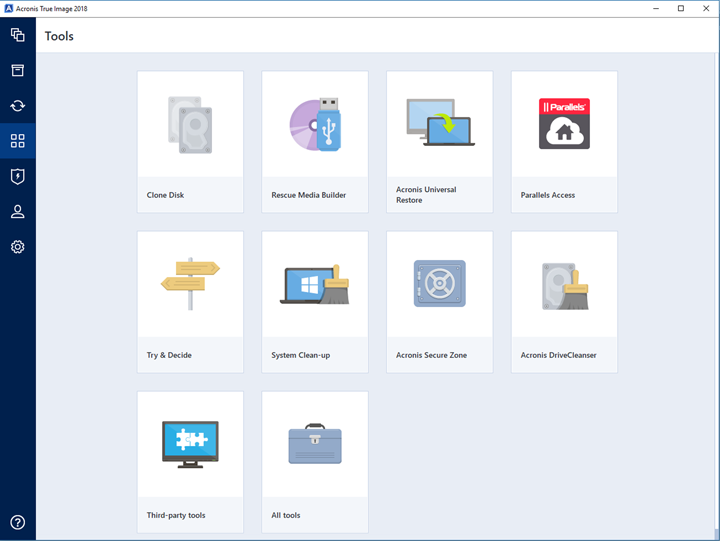 Acronis True Image 2018 adds some useful features to an already good product. The software is easy to navigate through, while being packed full of features to keep a computer safe and up to date on backups in a simple and easy manner. The same complaints, however, remain from Acronis True Image 2017. The online dashboard and cloud storage is slow as well difficult to access. Cloud Storage is useful for smaller files, but its speed largely depends on your upload speed. Overall, Acronis True Image 2018 improves on the features Acronis offers, but still needs some work in usability. Since safety is so important in an interconnected world today, it is critical to keep data safe from anyone who might be doing harm. 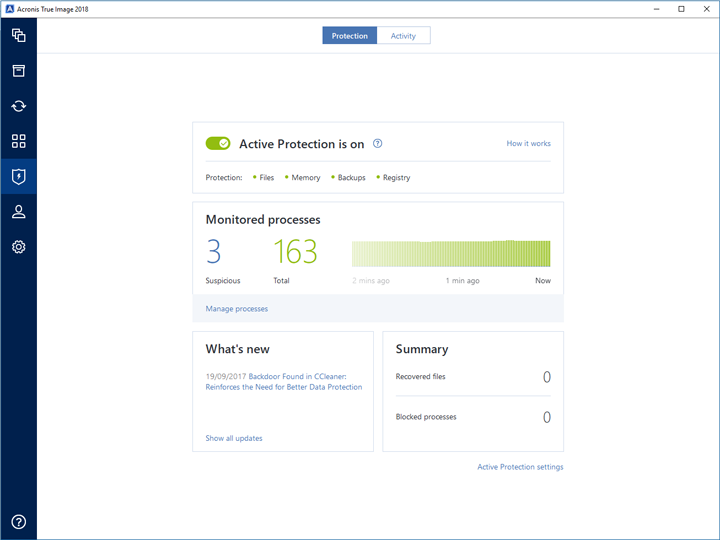 As such, Acronis True Image 2018 now has Active Protection 2.0 on all versions of the program, from the standard to the premium versions. Pricing for the Acronis True Image 2018 also works quite a bit differently. You can choose from buying a license for one, three, or five computers. I will be listing the pricing for one computer. The standard package is a one-time purchase of $50 USD, which is quite nice, however there is no cloud storage. The advanced version is a one year subscription with 250 GB of cloud storage for $50 USD. You can up the cloud storage to 500 GB for an extra $20 USD. As for the Premium subscription, the price is $100 USD yearly with 1 TB of cloud storage. There are options up to 5 TB of cloud storage, which costs an extra $160 USD. That is getting on the expensive side, however I doubt many individuals would be buying it. The standard package does not include a social media backup, cloud backup, real-time upgrades, phone support, blockchain certification of backups and files, and electronic signatures on documents. The advanced subscription does not have blockchain certification and electronic signatures, while the premium one has everything. I think the standard package is a great deal, but it is ultimately up to everyone and how they intend to use the program. All in all, Acronis True Image 2018 is a great piece of backup software. Using the program is intuitive, as well, Acronis makes keeping files safe an easy process. Acronis True Image 2018 is an improvement on the previous version, especially with Active Protection now being available in every package. Acronis provided this product to APH Networks for the purpose of evaluation. Acronis True Image 2018 builds upon the 2017 version, placing the safety of your data as its top priority. Do you have any comments or questions about the Acronis True Image 2018? Drop by our Forums. Registration is free, and it only takes a minute! posted 13 hours and 28 minutes ago, with 14 posts.